Stones are man made CZ's and Crystals, their may be color variations due to the size of the stones and the different suppliers. *Please Note, If you do not choose stone, we will ship amethyst as your birthstone. A very exquisite piece! A Sterling Silver setting holds the Birthstone of your choice. (Select Birthstone from dropdown menu on shopping cart page). 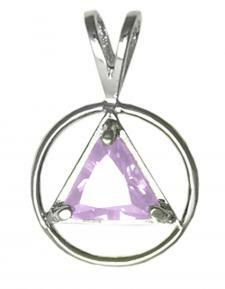 The AA Circle Triangle Symbol handcrafted from Sterling Silver. Please allow up to 2 weeks for delivery.